So we are just about to take part in a hackathon organized by Koding and my friend asked me to look up this PHP framework called laravel because it might come in handy for the project idea we have in mind. The supporting documentation for it is overwhelmingly for linux. So had to do some searching in order to figure out how to configure it on windows. I initially followed the instructions given in the official documentation. In it, the first step – installing composer – didn’t give me any issues. You just simply have to run the setup and that is it. However, the second step – installing laravel – gave me some issues. I was trying to follow the install via installer option of installing laravel. Although the installer downloaded, and the PATH variable set, the given command – laravel new – didn’t work. And regarding setting PATH, the given location is “~/.composer/vendor/bin”. However this is for linux. For Windows 7, “C:\Users\<User-Name>\AppData\Roaming\Composer\vendor\bin”. If all goes well, you should have laravel installed in the directory you specified (in this case, Test) and it would give something like this when you access it. 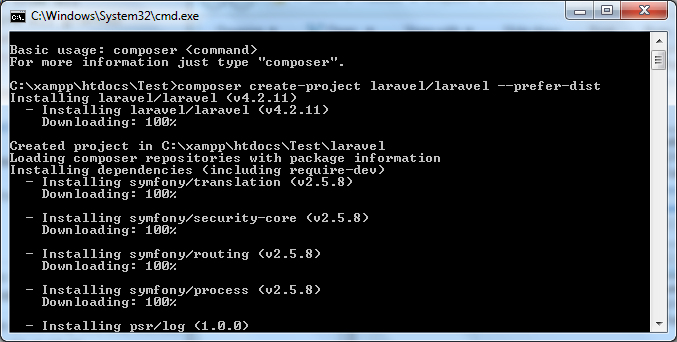 So today I needed to create a new laravel project using composer. I was using the network connect at the university and had to use the proxy. I had deleted the environment variables for proxy: http_proxy and https_proxy. And whenever I tried to create a project, composer just kept giving errors. After a looking through several resources, I managed to find a solution for it. Apparently, the problem was that for the connection, composer would use a SSH and the port differences in the proxy and SSH were causing the issues. To bypass the error, I just deleted the https_proxy from the environment variables. Afterwards composer started functioning normally again. However, now composer would be using just http and therefore, the data sent and received is not encrypted. This entry was posted in web development and tagged beginner, configuration, laravel, php, windows. Bookmark the permalink.